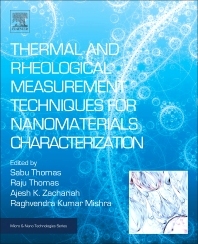 Thermal and Rheological Measurement Techniques for Nanomaterials Characterization, Second Edition covers thermal and rheological measurement techniques, including their principle working methods, sample preparation and interpretation of results. This important reference is an ideal source for materials scientists and industrial engineers who are working with nanomaterials and need to know how to determine their properties and behaviors. Prof (Dr). Raju Thomas is currently Vice Chancellor of Middle East University FZE, P.O. BOX 37173, Al Hamara, Ras Al Khaimah, and United Arab Emirates. Dr. Thomas started Professorship from Research and Postgraduate Department of Chemistry, Mar Thoma College, Tiruvalla-3, Kerala, India. Dr. Thomas procured Ph.D degree under the supervision of Prof. (Dr). Sabu Thomas, Director of International and Interuniversity Centre for Nanoscience and Nanotechnology, Mahatma Gandhi University, Kottayam, Kerala, India. He has extensive research experience in Nanoscience and Nanotechnology. He has twelve years of research experience in the Organic Chemistry and Polymer Chemistry laboratories of the School of Chemical Sciences, Mahatma Gandhi University, Kottayam, Kerala, India. He has also worked in the laboratory of Applied Rheology and Polymer processing of Katholieke University, Leuven, Belgium and in the laboratory at Leibniz Institute of Polymer Research Dresden, Germany. He has widely studied the kinetics of curing, morphology developments and structural characteristics of in-situ cured nanocomposites based on epoxy resin and reactive rubbers. His research is reflected in his six published research articles in international journals and additional articles which are currently under review. In addition, many articles are published in popular journals. He has co-authored many chapters and co-editor of a book entitled “Micro and Nanostructured Epoxy/Rubber Blends” which was recently published by Wiley and Sons. He has attended many national and international seminars/ conferences and presented many research papers. He is an approved research guide in Chemistry of Mahatma Gandhi University, Kottayam, India and has availed projects from University Grants Commission (UGC), Department of Science and Technology- Science and Engineering Research Board (DST-SERB) and Kerala Science Council for Science, Technology and Environment (KSCSTE). Prof. Ajesh K. Zachariah is currently working as Assistant Professor in the Department of Chemistry, Mar Thoma College, Tiruvalla. He had done Doctoral Research in Polymer Chemistry at School of Chemical Sciences, Mahatma Gandhi University, Kottayam, Kerala, India. He has ten years’ research experience in nanomaterials and characterization. Expert in sophisticated analytical techniques such as Atomic Force Microscopy (AFM), X ray diffraction Technique (XRD), Gas Permeability Tester, Dynamic Mechanical Analyser (DMA), Rubber Process Analyser (RPA)and Oscillating Disc Rheometer (ODR). Published nine internationally cited articles, two international books and applied one Indian patent. He presented articles in different national and international conferences. He bagged Young Technological Innovation (GYTI) Award 2013, the meritorious research scholar award from UGC, India in 2009 and young researcher award in Nanosat-2010. His research areas are nanomaterial, naocomposites, elastomer-elastomer blend systems, sensors, membranes, computational chemistry and environmental chemistry. Raghvendra Kumar Mishra is currently working as Senior Research Fellow at the International and Interuniversity Centre for Nanoscience and Nanotechnology, Mahatma Gandhi University, India. He has received India’s most prestigious Visvesvaraya Research Fellowship, and he is currently serving as Visvesvaraya Fellow. He has widely studied the processing of blends, in-situ generation micro and nano fibrillar composites, electromagnetic shielding effect of nanocomposites, decorating and alignment of carbon nanotubes and thermal, dynamic mechanical and structural relationship in polymer blends and nanocomposites .He has bagged several awards from different organizations and technology events. He is serving as reviewer in many international journals e.g. Environmental Chemistry Letters (Springer) etc. He has work as well research experience in Mechanical engineering, Materials science and Technology, and Nanoscience and Nanotechnology. His area of research is multidisciplinary which include Thermodynamics, Heat transfer, Refrigeration and Air-conditioning, Fluid mechanics, Machine design, Solid of Mechanics, Theory of Machine, Power plant engineering, Metal and Ceramic processing, polymers which include Polymer Recycling, Polymer blends, Fibre filled polymer composites, Particulate filled polymer composites and their morphological characterization, Ageing and degradation, Nanomaterials e.g. metallic , metallic oxide, Carbon nanotubes, Graphene, Conducting polymer blends, composites and nanocomposites, Biodegradable polymer blends and composites, Expertise in sophisticated characterization techniques such as Dynamic mechanical analyzer, Differential scanning calorimetry, Thermogravimetric analysis, Spectroscopy, Vector network analyzer, scanning electron Microcopy, Atomic Force Microscopy (AFM), etc.